Whenever I talk about my poor old farmhouse, I feel like I'm telling that children's story that goes, "fortunately, such and such good happened, but unfortunately then such and such bad happened." This weeks adventure once again unfortunately has to do with cats. I thought all of the cats had left the building, but apparently I was incorrect. For two nights I heard strange noises from upstairs - last night, it sounded like a cats was racing around and playing in my bedroom (which I haven't used since I moved back into the house - originally because I was worried about rats running around in the night). This morning I finally decided I had to investigate. I found the odd door into the attic-like storage room off of my bedroom wide open. 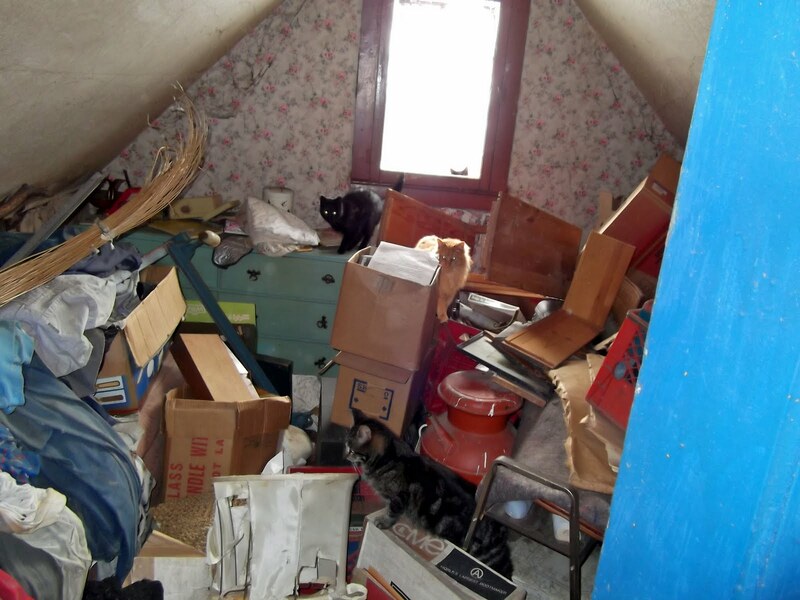 When I looked inside, I saw at least a dozen cats scurrying and leaping over boxes and piles of stuff that's been stored for decades and flying out of the window. The window that shouldn't have been open - in fact, it wasn't exactly open, it was broken. It took a while to clear a walkway through to the window - in the process I found the typewriter my dad gave me when I turned sixteen, the framed illustrations from Kahlil Gibran my grandmother gave me to decorate my college room, and jars of dried-up poster paint from my first teaching job when I had to buy all of my own supplies. The window glass was very old, very thin glass with little bubbles in it that I'm sorry to lose. It was knocked to the outside, so maybe there was a cat stuck in that room who finally burst his way out. I took the measurements to replace the glass, but I went into town so late that it was dark before I got home and there's no electricity in that room, so I left the door tied shut (with the electric cord from an old tv antennae tied to the frame of the bed) since the latch doesn't hold, and let the cats have the room for one more night. What's a little more outside air coming into this house? I'll fix the window with plexiglass and put a hook and eye to hold the door closed tomorrow. Definitely no rats in that room. Rughookers Bulletin Board - a place to buy and sell rughooking supplies, etc.